“It wasn’t easy trying to survive a bullet to the chin,” rapped Ondelee Perteet, 17, to the tune of Lil Wayne beats played off his smartphone on Nov. 5. The lyrics convey the positive attitude Ondelee has strived for since the shooting. Sitting with his mother, Deetreena Perteet, 45, at the kitchen table in the Bronzeville apartment they moved to after the shooting, he touched his Atlanta Falcons baseball cap and described the custom hat he plans to make. The moniker “Quadriplegic” will be emblazoned beside images of a bleeding falcon and a wheelchair. It is a message of empowerment, a claiming of the term from which some might shy away. It is also an assertion that he has succeeded and “become a star … and also in the process of becoming a man,” as he rapped, despite his loss of movement. Ondelee’s story has captured the attention of many. WLS, an ABC affiliate, followed him for months after the shooting, capturing his smile, enthusiasm and unyielding spirit. But his story is one that has become far more common. While the city’s homicide rate and overall crime have declined in recent years, the number of people wounded by gunfire has increased, according to a Chicago Reporter analysis of Chicago Police Department data. Between 2004 and 2007, the city averaged 1,751 incidents of aggravated battery with a firearm—the department’s classification for nonfatal gunshot victims. However, between 2008 and 2011, the city averaged about 100 more such crimes each year. Perhaps Ondelee and other young shooting victims are the lucky ones. Since 2008, more than 530 individuals under the age of 21 have been killed in Chicago—more than in New York City, Los Angeles or any other American city. If life is often an emotional roller coaster for teenagers, it is exponentially more so for Ondelee. He had a “meltdown” the other day, his mother said, where he talked about going out in the street and letting a car hit him. 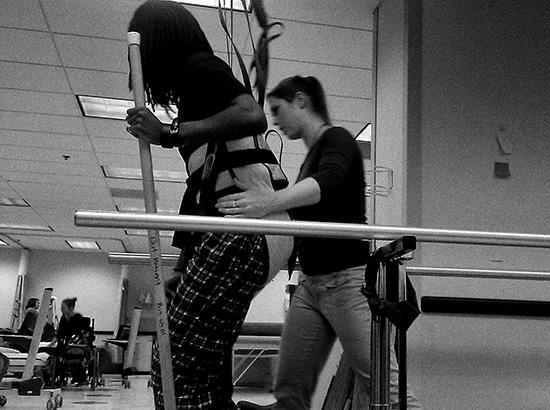 Ondelee has regained a remarkable amount of motion considering that doctors predicted he would never walk again. He had been undergoing intensive physical therapy several times a week at the Schwab Rehabilitation Hospital. He can move his left arm enough to do basic tasks and even play video games. He can move his feet around substantially while sitting in his wheelchair. And he recently walked for 15 minutes on the treadmill with the help of a harness. Ondelee’s therapy at Schwab ended in December because Schwab staff decided that his progress had reached its plateau, according to Schwab spokeswoman Dianne Hunter. Initially, Perteet was distraught and furious about the move. But she’s OK with the decision now. “I’m not a therapist, but give me a cane and I’ll get him walking!” she declared. “We’re going to keep doing exercises at home,” she said. In October, Robert Sansberry, 17, was convicted of aggravated battery with a firearm for shooting Ondelee. Sansberry had been told to leave the party after he argued with Ondelee; he returned later and opened fire, according to testimony at the trial, though Ondelee did not see who shot him. On Feb. 3, Sansberry was sentenced to 20 years in prison. Perteet said she doesn’t hate Sansberry, and she feels for his family, but she thinks he deserves a lengthy sentence. Perteet comes off as animated and resilient, but she shifts quickly and involuntarily to tears when she talks of how the shooting has changed her son’s life, and her own. Sometimes his friends come over and they talk and joke like old times, she said. But then when the other guys get ready to go out, her son can’t go with them. Perteet hasn’t worked since the shooting—taking care of her son is a full-time job, including going to Walter H. Dyett High School during the day to help him. She said former co-workers at the janitorial service where her mother also works continue to ask when she’s coming back. She struggles to make ends meet on the $698 a month in disability payments that Ondelee gets—the sole income supporting Perteet, Ondelee, his 15-year-old sister and his 19-year-old sister in college at Western Illinois University. Strangers and acquaintances have donated to the Determination Fund set up for the family, but Perteet worries public attention will soon wane while Ondelee’s needs will be lifelong. They are able to afford their Bronzeville apartment thanks to a Housing Choice voucher, which means they pay only a third of their income in rent. Sometimes, the disability payments just barely cover gas, food and other necessities, but sometimes they don’t. After the shooting, a car dealership donated a specially equipped minivan, which in April was stolen from outside their home. Later, another car dealership donated another vehicle. Ondelee had been using a lift to help him get in and out of bed. He’s regained enough strength and motion in his arms that he no longer needs it. So, in a gesture to repay the generosity shown them, Perteet hopes to donate the lift to another family. She said her sister was shot two weeks after her son was shot. In one of countless family photos in collages on the walls, her sister and son both smile brightly, the braces on her sister’s arms the only hint that something is not right. “He’s doing as well as he is today because of all these people,” said Perteet, sweeping her hands across the family photos. Near the photos hangs her son’s certificate naming him a Peace Ambassador by New Life Community Church and for making the honor roll at Orr last year—he transferred to Dyett prior to this school year. Perteet said she would be able to accept her son’s injury more easily if he had been involved in gangs and violence himself—but that wasn’t the case. When asked about college, Perteet said that her son visited Chicago State University. He indicated that he would rather go out of town. “You can’t do that,” she stated flatly. 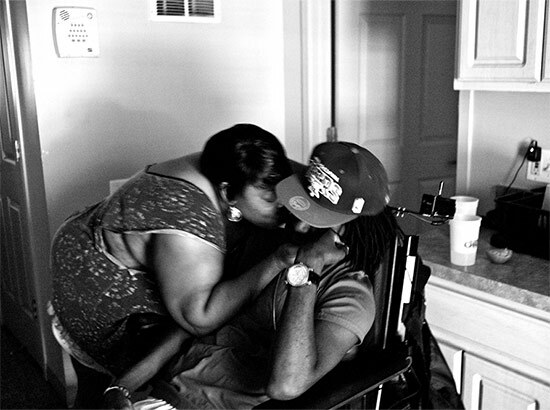 As Ondelee described the Quadriplegic hat he wants to design and rapped at the dinner table, he and his mother smiled and laughed together, brainstorming about how he can find time in a recording studio or set up some affordable digital recording equipment at home. After dinner was cleared, Perteet told her son he should do his exercises. His face went blank, as if a curtain had been pulled over the sparkling smile. He ignored her at first but then burst out, “You don’t know how much it hurts.” He was still sore from the treadmill two days earlier, and not just his legs but his abdominal muscles and shoulders, especially from holding up his paralyzed right arm. “That’s your muscles getting stronger. That’s how you’ll get to walk and use the restroom alone,” she encouraged. He shook his head slightly, not meeting her eyes. Donations to the Determination Fund can be sent to PO Box 53598, Chicago IL 60653. This article is second in a series on youth violence. Funding for this project was provided by The Chicago Community Trust via the Community Media Workshop, the Richard H. Driehaus Foundation, and the Mansfield Institute for Social Justice and Transformation. 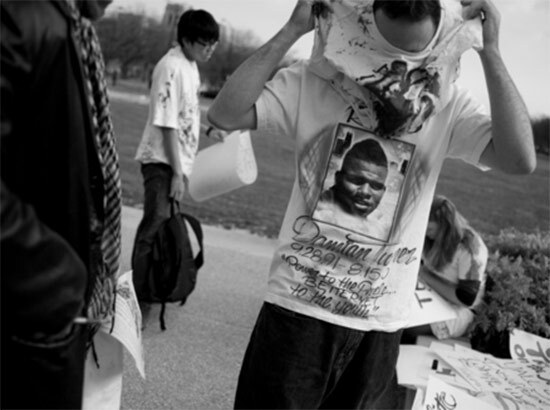 In 2009, when Ondelee Perteet was 14, he was shot in the jaw at a birthday party on Chicago’s West Side. The bullet severed his spine, paralyzing him from the neck down. His doctors told him that he would never walk again, but three and a half years later, he is beginning to walk with the help of crutches.The Chicago Reporter has been following Perteet’s story over the past year. Inspired by the death of 18-year-old co-founder Damian Turner, Fearless Leading by Youth challenges some of Chicago’s most powerful institutions. 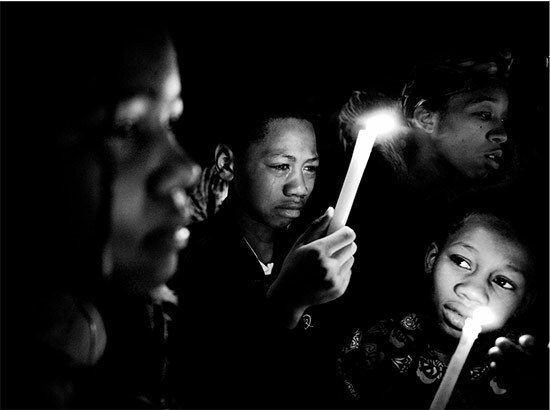 Since 2008, more than 530 youth have been killed in Chicago with nearly 80 percent of the homicides occurring in 22 African-American or Latino community areas on the city’s South, Southwest and West sides.